#23 of 24, Slayer Scion – A car can be more than just an artistic mechanical display. It can be a way of remembering your favorite parts of the good old days. Remember Slayer? 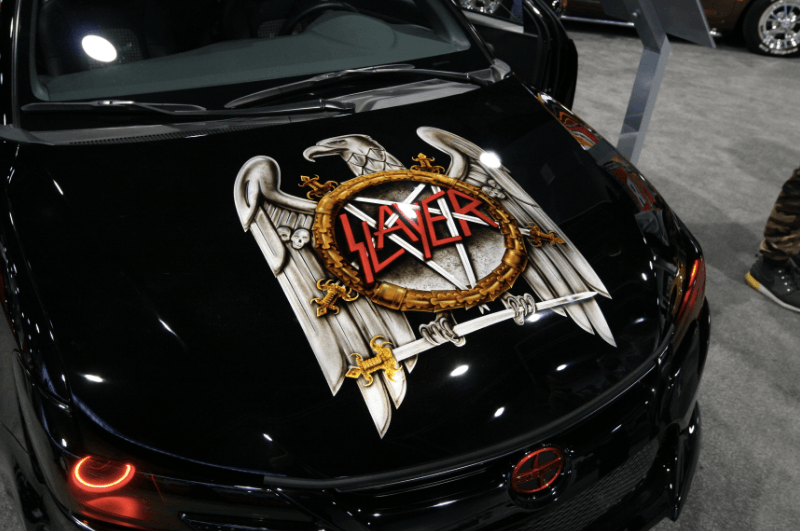 The Eighties metal band deserves to have its logo painted across the hood of a beautifully detailed car. Why not reverse-hinge the doors while you’re at it? Just don’t ask why this car was rolled off the assembly line years after the band was in its prime. When he's not writing, he's reading. When he's not reading, he's listening to music. As the host of an online internet radio show, Vince uses what he's learned (and what he continues to learn) about social media marketing to further enable that hobby and give him ample excuse to spend a majority of his earnings on music CDs. So far, his better half remains convinced that it's a good idea.